Hamstring stretches are an important part of any workout or rehab programme. Hamstring stretching exercises can help to reduce pain, increase flexibility and improve function. The reason for this is because having tight hamstrings puts you at risk of knee pain and injury, so having good flexibility is important. Most people have some tightness in their hamstrings, especially people who spend a lot of their day sitting. I'm sure if you asked them to, most people would have a go at doing hamstrings stretches, but lots of them wouldn't do them correctly. They might start in the wrong position making it ineffective or stretch in a way that puts lots of tension on the sciatic nerve which runs down the back of the leg, rather than stretching their hamstrings. Here we will look at how to tell if you hamstrings are tight, and then look at three great stretches which can help relieve knee pain and prevent injuries. Each is done in a different position so you can choose the one that best suits you. 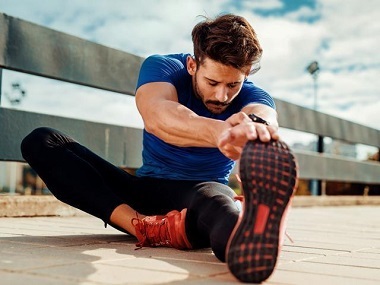 There are other ways to do hamstring stretching exercises, but these are the ones I find people get most benefit from and are simplest to perform accurately. 2) Pro's Test: Lie on your back and lift your leg up so your hip and knee are bent to 90°. Then try and straighten your knee without moving your hip. The angle at your knee will tell you if you have tight hamstrings - women should be able to get their knee within 20° of fully straight, and men within 30°. If you can’t, it's time to stretch. How Do I Do Hamstring Stretches? If you do have tight hamstrings, have a go at these simple stretches. You only need to do one of these hamstring stretches for knee pain - pick whichever you prefer. To get the maximum benefit for the least effort, hold each stretch for 30 seconds and repeat 3 times - you can find out more in the knee stretches section. TOP TIP: With each of these stretches, you should feel the stretch in the middle of the back of your thigh, rather than at the knee. To ensure this, you want to have your leg slightly bent. That takes the tension off the sciatic nerve and directs it towards the hamstring muscles. To get the best results from these hamstring stretches, see the stretches guide for top tips on getting the maximum benefit from the minimum effort. If you want to find out how to stretch your other leg muscles check out the quads, glutes, calves and ITB stretches pages. Remember, the best way to tell if your muscles are tight is to see a physical therapist who can fully assess you. Having good flexibility is just one part of keeping our knees healthy. We also need good strength in the muscles - have a look at the knee strengthening exercises section to find out more. SAFETY ADVICE: If you have suffered an injury such as a hamstring tear, you should not start doing hamstring stretching exercises too early or you may cause further damage. Always consult your doctor first.